Plan a project with us? Get in touch today. Self service car wash buildings can bring in a great amount of revenue for your car wash business and provide a cheaper alternative for your customers. Many people still prefer to wash their car themselves as opposed to driving through an automatic car wash, plus self-service car wash buildings offer customers a cheaper option to automatic. They may not have an area where they live to wash their car themselves, so they will come to a self service car wash and use soap and water provided by your car wash business at a lesser fee than automatic. What Do Self-Service Car Wash Buildings Include? Additional features such as dash board cloths, streak free soap and air fresheners are also available. These add-ons only increase your revenue while providing your customers with a great, full-featured service they can customize. Self service car wash structures meet the needs of everyone involved in a car wash business. As a business owner, you are able to bring in a great revenue stream at any time of the day while your customers can choose whether to use a timely automatic car wash or self service car wash on their own. You will need fewer personnel for these types of businesses, and many times none at all! When it comes to car wash building design, New Horizons are second to none. We have built many different self service car wash structures for our customers based on a variety of customizable options. Our car wash structures satisfy both business owners and car wash customers alike. We are seasoned builders of glass car wash buildings, automatic car wash structures and self service car wash buildings. We also build custom options like kneewall upgrades, equipment rooms and additional vacuum bays. These clear glass structures, paired with our custom options, have made us the best choice for car wash businesses across the country. New Horizons puts aspects of car wash building design into your hands so you can create the customized car wash building you desire. Your business will benefit greatly from a self service car wash building from New Horizons! Our builders are experienced in self service car wash building and our car wash buildings are elegant, functional and cost-effective. Ready to get started? Get a quote for the price of our self service car wash buildings today! Our self service car wash structures are a standard length of 16′ 4″ wide x 20′ long. Choose the number of self service car wash bays in your structure depending on your business needs. As your business grows, add on more bays to suit your needs. Our structures are completely modular so adding more bays is as easy as can be. Our vacuum islands have a powder coated aluminum frame with side panels to match your knee wall upgrade and provide your customers with more hand cleaning options. Islands provide a beautiful and efficient way of mounting vacuum and vending items in your self service car wash enclosure. Customize your automatic car wash enclosure both inside and out by upgrading the knee wall. For your car wash construction, we offer a choice of brick, block, stucco, split-faced or other composite material panels for the exterior. All knee wall upgrades include polycarbonate interior panels. Like all of our products, custom color choices are available. 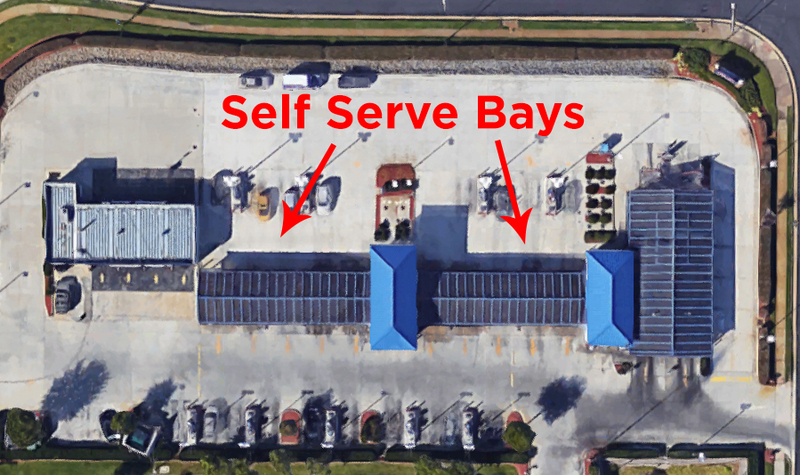 Self-Serve bays from New Horizons are built to the same structural standards as our automatic and tunnel structures. 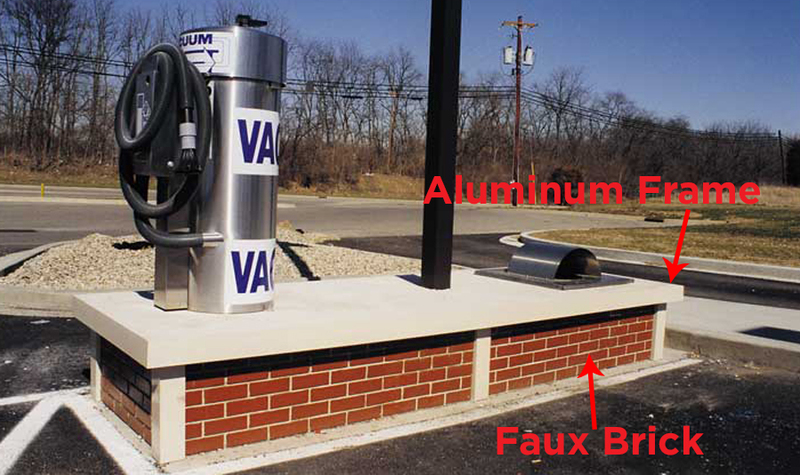 Self-Serve bays are constructed from high grade extruded aluminum. Pre-engineered and fabricated modular building compromised of extruded aluminum and factory welds of such thickness and depth as to satisfy loading requirements. Makes use of concealed base sidewall fasteners. Overhead doors are framed for 10’x10′ doors, not supplied by New Horizons. Consolidated to a single delivery directly to your work site on factory trucks to assure on time scheduling. Our powder coated aluminum chaseway is a great way to hold gas, electricity and water supply lines in an attractive conduit. A chaseway is a necessary addition to any automatic car washes building. Rigid framed aluminum, polycarbonate and glass glazed structure, sold as a complete unit. Stamped drawings are site specific and reflect individual location requirements. Installed by factory personnel or your general contractor. All fasteners used are stainless steel. Ten millimeter; co-extruded, CC-1 fire rated, bronze tint polycarbonate panel (per CCSI International, Inc. specifications). Exterior passageway doors allow personnel to access the main car wash building. Car wash construction that includes heavy duty aluminum doors provide secured access. 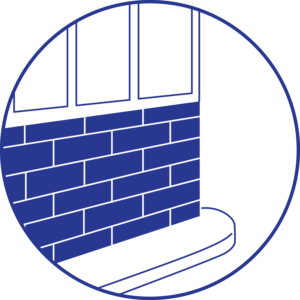 Passageway doors are effective safety measures for customers using your facility and also aid in meeting local building code requirements. Single glazed clear tempered safety glass panels measuring 46″ x 125.25″ x 5mm. Double glazed tempered safety glass available. Personnel entry doors in wash bay fabricated with extruded aluminum and tempered safety glass. Factory applied electrostatic powder coated surface per customer approval of color provides superior protection and appearance.